Speed and security are essential for the success of any website, so a free service that supercharges your site and protects it from those many web-born threats? Priceless. This is why CloudFlare was a runner-up at Disrupt SF last year, because it is attempting to bring speedy load times to the average site owner. Though CloudFlare may not be the sexiest business in the world, it’s a service confronting a real problem, and for that very reason, nearly 12 percent of the Internet’s users (approximately 125 million unique monthly visitors) passed through CloudFlare’s network since its launch in September, according to CloudFlare CEO Matthew Prince. CloudFlare, he continued, has been providing a 40 percent performance boost on average, and has stopped nearly 1 billion attacks launched against its users’ websites. Though the CEO did not specify what kind of attacks these are, the statistics (including 3.5 billion page views per month) are impressive nonetheless. 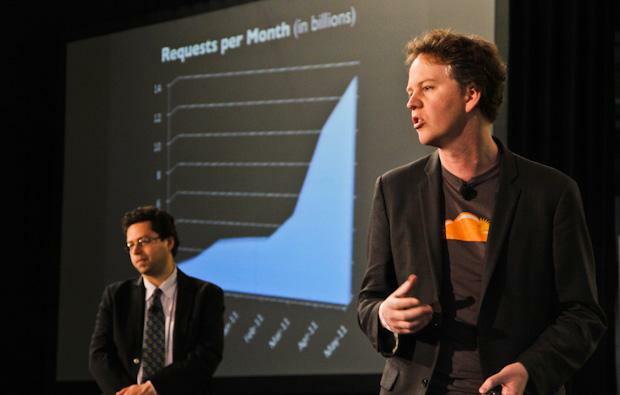 Today, at Disrupt NYC, CloudFlare announced plans to extend its security and speed boosting service to web apps. The new product, called CloudFlare Apps, is a service that makes installing web applications fast, safe and one-click-simple. Prior to CloudFlare Apps, using web apps required a website owner to change their code and, potentially, decrease performance and increase security risks as a result. CloudFlare works with app providers to ensure CloudFlare Apps perform at full functionality and don’t create conflicts with other code. The best part? CloudFlare Apps are automatically updated to the latest version without the website owner needing to make a change. The service, which will begin rolling out June 1st, includes applications from VigLink, Clicky, Apture, Smartling, UserVoice, SnapEngage, Google Analytics, Google Webmaster Central, and more. CloudFlare is also announcing a second product called “Rocket Loader”, which will allow a user to sign up in 5 minutes, triple their site’s performance, protect it from attacks, and starts off … by being free. Oh yes. Free. In other words, Rocket Loader will automatically optimize the code on a user’s site so you can get app-like page load speeds. CloudFlare wanted to do something for apps that you won’t find in the app store and that is browser agnostic, so they created their own version of SPDY — for every web browser. In fact, Prince said that Rocket Loader was actually inspired in part by Google’s work on its SPDY protocol, as SPDY enables multiple resources to be served via a minimum number of network connections, it was a matter of applying it to CloudFlare’s tech, and making it universal. CloudFlare Rocket Loader ensures websites load as fast as possible based on the device and code on the page, even if that code is pulled from a third party service. Third party services, like ad networks, the Facebook “Like” button, or the “Tweet” button have previously been performance-robbing speed drains, even if the site owner has optimized their own code. CloudFlare is provisioned via DNS, meaning web admins are excused from having to add hardware, software, or change code to get the benefits of CloudFlare, including Rocket Loader. So, no longer will you have see that “waiting for…” text at the bottom of your browser, for your web apps or your websites.